To reduce plastic waste and negative effects, recycling programs have been implemented in many parts of the United States, but remain underutilized. Much is due to the nature of plastic itself, which often can only be “downcycled” rather than recycled — a torn plastic bag might eventually be transformed into a lunch tray, but it will never be a plastic bag again. Many cities and states have begun more serious efforts to restrict their use, but the subject remains a matter of considerable debate. 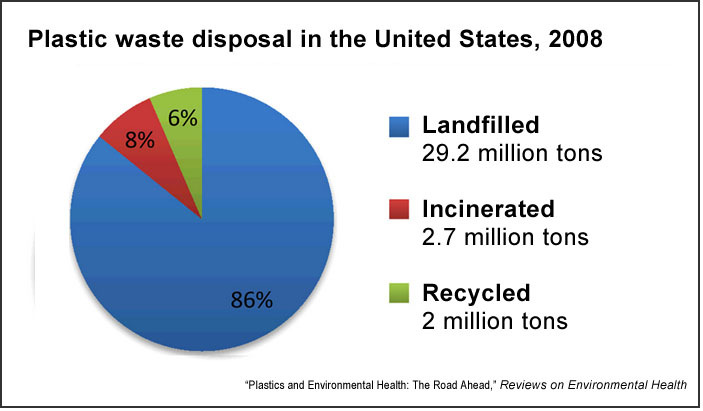 While plastics also contain substantial energy, the vast majority ends up in landfills. Immense quantities of plastic are also sent to the developing world together with e-waste, where “recycling” frequently involves open-air burning. No sector illustrates the inherent contradictions of plastic more than health care. A 2014 research review published in the Reviews on Environmental Health, “Plastics and Environmental Health: The Road Ahead,” notes that plastic is an ideal material for single-use disposable devices, because they’re “cost-effective, require little energy to produce, and are lightweight and biocompatible.” Yet the chemical compounds within plastic can damage human health. In their work, the scholars, Emily North and Rolf Halden of Arizona State University, summarize relevant research findings on the benefits, dangers, disposal of, and future innovative potential for plastics. The study received funding from the National Institute of Environmental Health Sciences, a government research body. On average, 300 million tons of plastic are produced around the globe each year. Of this, 50% is for disposable applications such as packaging. Plastics make up 85% of medical equipment. IV bags and tubing alone constitute up to 25% of hospital waste. In all, U.S. hospitals discard approximately 425,000 tons of material annually. Plastics manufacture makes up 4.6% of the annual petroleum consumption in the U.S., using roughly 331 million barrels per year. None of this energy is recovered when plastics are disposed of in landfills, and very little is recovered when plastic waste is incinerated. 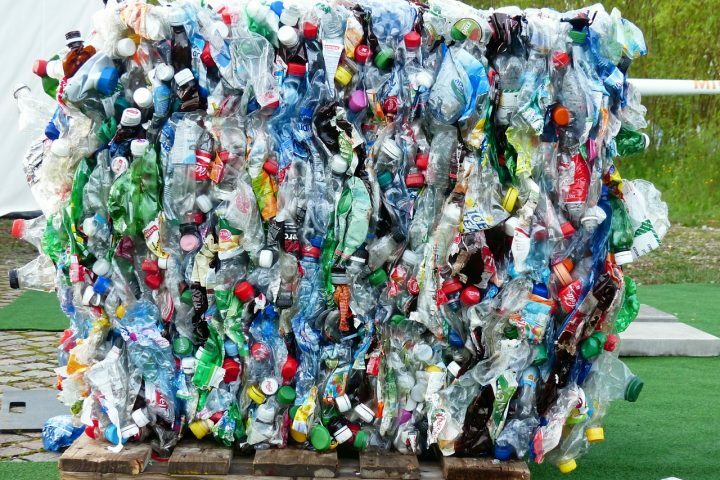 Recycling plastics poses major logistical difficulties, including effective sorting (which increases costs) and the mixing of different plastic streams affecting the resultant post-consumer products. Environmental exposure to plastic-related chemical compounds does not occur in isolation but as a “cocktail effect,” with unknown cumulative impacts. Components of plastics currently being studied for their health effects include polyhalogenated flame retardants, polyfluorinated compounds (known as PFOS or PFOA) and antimicrobial compounds such as triclosan and triclocarban. Biodegradable plastics are more expensive to produce, and many use plant resources such as corn or molasses, thus creating competition for food supply. Commercial facilities test biodegradable plastics at 58 degrees C and 60% relative humidity, whereas at-home composting mechanisms may not meet these conditions and may therefore produce incomplete biodegradation. Pilot “curbside composting” programs in Boulder, Colo., increased waste diversion from landfills from 40% and 69%, indicating that consumers are willing to use better disposal methods if available. Related research: A 2012 study published in the Review of Environmental Economics and Policy, “Alternative Policies to Increase Recycling of Plastic Water Bottles in the United States,” explores how to improve recycling rates. The researchers, from Duke University and Vanderbilt University, used survey data from more than 600 respondents in 2009 to examine the effects of different recycling regimes on the recycling rates for plastic water bottles. Citation: North, Emily; Halden, Rolf. “Plastics and Environmental Health: The Road Ahead,” Reviews on Environmental Health, 2014, 28(1):1-8. doi: 10.1515/reveh-2012-0030.